Through my cool horse trainer I found the amazing artist, Dorota Kudyba (www.dorotakudyba.com). She does equine dream art from photographs. I commissioned her to do several pieces for me, and I thought you guys would like to see some of them. Here's the first of Anjo and me. 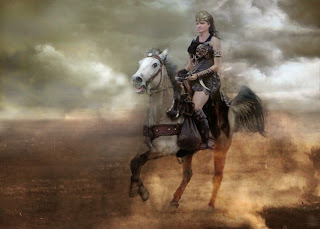 I asked Dorota to make me a Valkyrie-like warrior. Ooooh! What do you guys think? That picture looks great! You even look a bit scary as a Valkyrie Warrior! Thanks Ang! I think Anjo looks super fierce! I have a question though I was not sure if I shoul have asked for it. You see, in your books all the vampyres are rather handsome, beautiful, strong and great in many, many kinds. I've also noticed that one of the bad characters is shown as ugly, not handsome at all boy. Maybe I just didn't understand it well but can't there be fat and not so pretty vampyres in House of Night? I ask not because of my private business. I myself am not fat, etc. but I am Goddess movement follower and it is religion where all the people are welcomed as soon as they are honest to our Gods. It's more about finding your inner beauty and also about seeing outer beauty in everything, in all the people. Yes, I do see that we all perceive fat and slim, ugly and handsome people in other way. I sometimes do it myself but I try to change it. I think that it is very, very important in nowadays society based on tolerance. I do not try to blame you for anything. I am just asking, what do you think? Jared - I will write a new fantasy series, but it will not be about vampyres. Autor - I developed my vampyres based on biology. They are predators, which means they have evolved to survive by being extremely attractive to their prey - humans. Thus the reason a successful, well-evolved vampyre is handsome or beautiful. It's not a social statement - it's biology. Absolute Best of the Best! Happy 4th of July with an Anjo View!